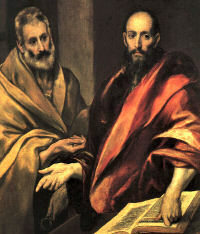 Lord our God, encourage us through the prayers of Saints Peter and Paul. May the apostles who strengthened the faith of the infant Church help us on our way of salvation. We ask this through our Lord Jesus Christ, your Son, who lives and reigns with you and the Holy Spirit, one God, for ever and ever. Amen.